The Lincoln Cathedral Artist in Residence for 2019 has been announced as the Revd Matthew Askey. The residency title will be – Our Sacred Journey: People of the Bible and will challenge us to consider our lives as being on a sacred journey, a pilgrimage, and to recognise ourselves as being holy and special to God. From May to December this year, the Revd Matthew Askey, will work with visitors, volunteers and members of the congregations, helping them to explore biblical characters with whom they can relate their own life story. The Bible is full of people who are exploring every shade of life’s ups and downs. Many of its stories and characters can inspire us to recognise God at work in our own lives and encourage us to recognise our own life as a part of this bigger story of humankind, in all its awe, wonder, and sometimes in its humour. Exploring these characters and reflecting that our own life journey is special to God and given for a purpose, we are invited to recognise that we too are on a sacred journey, in which we can find blessing and fulfilment. Visitors, volunteers and worshippers of Lincoln Cathedral will be offered the opportunity to meet the Revd Matthew Askey, and be part of a major cathedral art exhibition in January 2020. These meetings are either individually or in small groups. Those participating will be helped to choose a Bible character or story that they can identify with personally and be photographed for a portrait in which they will be portrayed as that character or as a part in their chosen biblical story. The photographs will be used as the basis for making a unique painting in egg-tempera (an ancient painting media used by medieval manuscript painters and icon painters). Examples of the paintings are available for all volunteers to view in the artist’s working area when they make their visit. These small scale paintings will be in a circular format, between 20cm diameter and 40cm diameter. An exhibition at Lincoln Cathedral in January 2020 will bring these new works together with the person’s name and reason for choosing this character, and will help us to link our lives today with the lives of the chosen Bible characters. About the artist: The Revd Matthew Askey currently serves as School Chaplain at Southwell Minster, Nottinghamshire’s cathedral. In addition to being an Anglican priest he is a professional artist and is involved nationally in art/faith initiatives, having trained in Fine Art painting at MA level. He regularly leads art/faith quiet days and gives lectures, talks and conference papers. In 2015, he was part of the commissioning committee for a major new memorial window at Southwell Minster by artist Nicholas Mynheer. In 2016 he initiated, organised and curated at Southwell Minster a 22 artist exhibition of new contemporary works “The Art of Mary”, and again in 2018 at Southwell a major 36 artist exhibition of 100 new works: “Crossings: Art and Christianity Now”, both of these exhibitions had supporting programmes of events (conferences, lectures, musical events, school tours etc). The Revd Matthew Askey initiated and has led the Artist in Residence programme at the monastery of the Community of the Resurrection (Mirfield, Yorkshire) since 2008, and is himself Artist in Residence for the Society for the Study of Theology (SST) conference, ‘Theology and Grace’, at the University of Warwick in April 2019. His most recent exhibition was as a shortlisted artist at the Gallery in Oxo Tower, London, as part of the inaugural Chaiya Art Awards in Spring 2018. 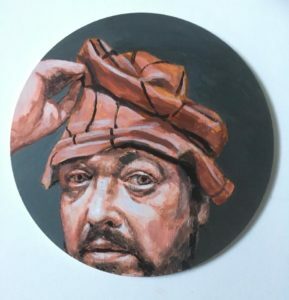 His practice as an artist is in small-scale figurative painting and drawing, with a special interest in Biblical subjects and self-portraiture. The artist will be present in Lincoln Cathedral from May to December for a half day each week.